The acting meant nothing to me, nor the much-discussed sexual fluidity, nor virtually anything released in the dozen years between 1981-1993. I expect it’s a rare person who adores with equal value everything David Bowie created, but of course that commitment to experimentation is why the expression of grief has been so huge. However you discovered him—as Ziggy, on SNL, in Labyrinth, on tour with Nine Inch Nails—it was probably a defining moment for you and, oh no, love, you weren’t alone. I remember, as a young teen raised on ’70s pop radio, buying Scary Monsters and being downright unsettled by the sonic splatter painting of “It’s No Game, Part 1,” so strange were the sounds to my innocent ears. Practically from that point on, I’ve sought two things from pop/rock music: a dedication to song craft and the power to wow me with inventiveness, and Bowie’s been a standard bearer on both counts. In the week following his death, I’ve found the most catharsis in focusing on his music, his creative process, and his down-to-earth side (as opposed to the personas, the clothes, the gender-bending, or his position as a beacon to the disaffected). I’m a better appreciator than a writer, so rather than add to the mountain of What He Meant To Me I’d like to present some of the more worthwhile overviews, observations and memorials that I’ve encountered, with a crucial TV performance thrown in for good measure. A loving and thoughtful essay by Momus (Nick Currie), a musician/writer/artist whose career and trajectory have been deeply informed by Bowie. Mark Saunders, recording engineer on the sessions that produced the Absolute Beginners soundtrack as well as the “Dancing In The Street” single, recounts a hurried but amazing night in the studio, and managed to captured some tape of Bowie impersonating other singers (his Springsteen and Iggy are very good) while screwing around between takes. A deep dive into one song, produced by Danish television (circa 2007, I believe). Bowie discusses his failed venture at setting English lyrics to Claude François’s “Comme d’habitude” (which Paul Anka would later succeed at transforming into “My Way”), and how “Life On Mars” was an attempt to reclaim the song for himself. Also included are Rick Wakeman, producer Ken Scott, and photographer Mick Rock who later directed a music video for the song. Producer Tony Visconti explains the creation of the song “Heroes”, highlighting individual elements of the multi-track recording one at a time on the mixing board. This 50-minute show presents behind-the-scenes details I’d not heard before about the making of the albums, lingering especially on the years 1969-1972. 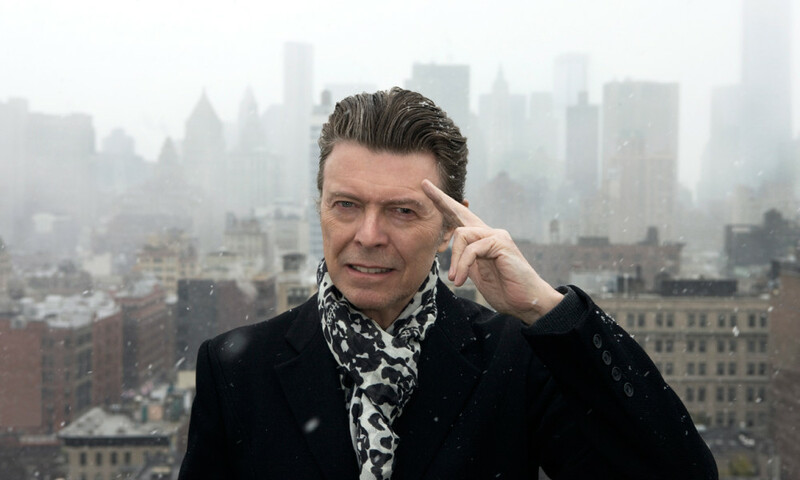 Recollections from Bowie, his musicians and producers are vivid enough to put you right there. I especially appreciated the section on Hunky Dory, probably my favorite Bowie album but one that tends to get overshadowed by its extravagant neighbor. Few things bring your idols down to your level like seeing them gush about the music they love, and this is Bowie’s list of 25 favorite albums. It delights me to think that had I ever met him, I could have sung something by The Fugs (preferably “My Baby Done Left Me”) and he might have joined in. Tony Visconti and Donny McCaslin discuss Bowie’s love of jazz, his collaboration with the Maria Schneider Orchestra, and the making of Blackstar. Newell, one of England’s best and most prolific underground rock songwriters/musicians, is also one of its most-published poets. Himself an aspiring glam rocker in the early ’70s, he titled his autobiography of those years This Little Ziggy. And of course Heddon St. is where Bowie posed for the cover of the Ziggy Stardust album; I almost made a pilgrimage there on a recent trip to London, but was dissuaded by the fact that Google’s street view of the address seemed to indicate that it had been engulfed by a restaurant’s patio. His desire to challenge what could be done with the technology and format of live television is what separated him from countless musicians who are content to stand there and sing. Zappa (particularly Freak Out!) was influential on young Bowie so it’s a shame this meeting went down as it did, but it’s still a fun read for fans of both. This writer summed up my thoughts and feelings better than I could; I’m grateful. There could be no more perfect ending. The king is dead, long live the king. A number of artists also performed and paid tribute at a memorial event in London’s Union Chapel six days after his passing.